The eye-catching houndstooth prints, are the Fifties classic and seems to stay on trend forever during the colder seasons like fall and winter. If you’re looking for a print pattern that’s not too bold or loud in any way to add to your fall and winter wardrobe, you might want to consider going for the houndstooth. Houndstooth print has always been popular during the colder seasons like fall and winter. In fact, you could almost say that the houndstooth print is the staple print of fall and winter just like how florals are for spring and summer. The classic houndstooth print is made of black and white jagged checks and this is great for adding a chic and sophisticated touch to your look. If you like colors, though, you can also get them in other hues though most of the time, it’s a combination of black and a bright color. Anyway, if you’re looking for ideas on how to wear houndstooth, check out these outfits and tips below. Head to toe houndstooth – if you’re brave and bold enough, you can try sporting houndstooth from head to foot. It’s a fun and fashion-forward way to wear this gorgeous print pattern and there are several ways to achieve this look. One of the simplest and easiest ways, of course, is to wear a houndstooth printed dress. A one-piece dress is an easy way to wear any print from head to foot. You can also get in on the suiting trend and rock a houndstooth suit or, if you want something more flexible and something that offers you more freedom and options, you can simply wear whatever you feel like wearing and top it off with a houndstooth coat. 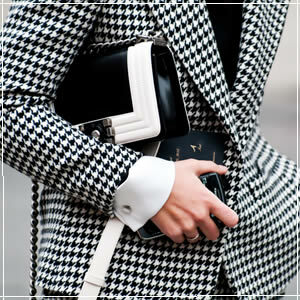 Classic black and white –think the houndstooth print is tricky enough on its own? Take the safest route and wear it in black and white and with black and white. This is a great, refreshing twist on the minimalist trend. It’s bold enough to make a statement yet still has that subtle vibe because of the muted colors that are black and white. Colorful and cute – are you the type who can’t get out of the house without the least bit of color in your outfit? If the classic black and white houndstooth is too basic for you, you can always add a little more cheer to your look and pair your houndstooth printed piece with something bright and colorful or you can also go for a colored houndstooth pattern. Bright colors tend to pop really well against black and white houndstooth print so it’s a great combo to sport on days that need a little bit of fun. 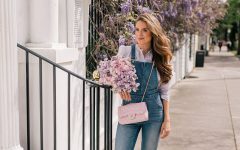 Accessorize in houndstooth – not a lot of women are comfortable with wearing prints that are out of their comfort zones and if you’re one of them and you’re afraid of not being able to pull off houndstooth on your clothes, why not accessorize with it instead? A houndstooth printed scarf is sure to add lots of sophisticated glam to your look. You can also slip into a pair of statement houndstooth shoes when wearing a simple outfit to keep it from looking boring. Mixed and matched – now, for the really bold and adventurous fashionistas out there, here’s something more challenging: wear houndstooth with other prints. The print on print trend is still in full force so why not add the houndstooth print to your arsenal of printed patterns to mix and match?